"Jason is a fantastic music and sound facilitator. He brings tremendous energy, knowledge and skill to his programming and in a very hands-on way. He encourages participants to look at the material world around them and find new appreciation for the sounds created by everyday objects. He does this through activities that are deeply engaging for both younger and older audiences alike. Jason has endless talent and is chock-full of creative ways to help young people explore their world." 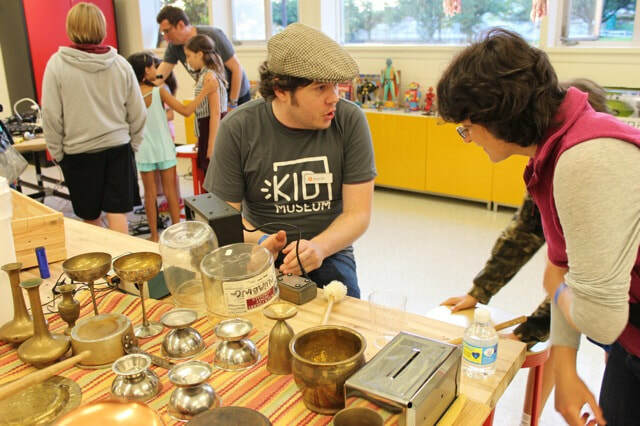 "Jason's Music Discovery Lab workshop at the Petworth Community Market with Knowledge Commons DC was truly a 'hit'! He can make percussion instruments out of anything--for example: parts of a picnic table, a vase, a door jamb, or an old stove vent. He taught us how to be curious about sounds, to listen carefully, and not to be afraid to experiment with ordinary household objects. I was particularly impressed by the simple ringing sound he showed me how to make from the top of a pot. It sounded like a singing bowl used for meditation. Magical! He also showed us how we could improvise and play music with others. During the workshop, he worked with a multi-generational crowd--ages 2 to 70. But, whatever the age of the musician, he had great feedback and practical advice for honing their skills. Some of the musicians were shy to get started and he made them feel at ease, and soon they were tapping away. After this workshop, I am now looking at all the items I have at home differently--what would produce the most awesome sound?" --Sonia Booth, Teaching Coordinator at Knowledge Commons DC, Washington, D.C.
"I recently attended Jason's Music Discovery Lab workshop at Pyramid Atlantic Art Center. I didn't have much hands on experience with percussion instruments coming in, but this wasn't a hindrance to following along with the exercises Jason led us through. Jason is a very easygoing and enthusiastic instructor and makes learning fun. He started out with a basic hand clapping drill, and then demonstrated some basic principles of rhythm, texture, and timbre using a combination of traditional instruments and found objects. Each participant was encouraged to use a basic rhythm as a starting point and expand upon it incorporating extended techniques with the equipment available. My favorite part of the workshop was collaborating with four other players in an 'avant-garde drum line' using a snare drum and finger cymbals to create an interesting assortment of unexpected sounds." "Jason's Music Discovery Lab was delightful. My 7 year old son loved it. Jason was encouraging, patient, and inspired creative exploration of all things in the room - including a bucket of water! Who knew water could make music?" "Jason is an inspirational teacher and coach for aspiring drummers of all ages. He'll take you through the fundamentals and, moving on to the full kit, make it fun. In a series of lessons, I've learned about hand position and posture, technique and sight-reading, keeping the pulse in your mind and body, and the need to experiment on your own. Our sessions can be challenging, but they also build confidence. I was impressed by Jason's exceptional musicianship and outgoing personality when I first saw him perform in 2006, and my respect has only grown as I've come to know him as an in-demand percussionist, occasional collaborator and good friend. As someone dedicated to the art of teaching, he brings a long and productive musical background -- and a serious love of music -- to his mission. Knowledgeable in theory but not bound to it, Jason is the kind of teacher I wish I'd had when I was growing up." -- Keith Sinzinger, Washington, D.C.
"I had the pleasure of attending workshop at Pyramid Atlantic a few weeks ago. His approach to creativity and experimentation in rhythm was refreshing and it gave me new ideas that I can use on my own drum set. I have also been searching and listening for hidden percussive sounds ever since. It was a fun, hands-on workshop, and I would recommend it to people of all ages, regardless of their musical inclinations." "Jason is the man! He is patient, skilled and knowledgeable. Our 8-year old really looks forward to his weekly drumming lesson and clearly relates to Jason's easy-going and affirming teaching style. He's been taking classes for a few months now and we can really tell he's getting it and building on the fundamentals that Jason is teaching him. As Jason told us, our son might not decide to play drums down the road but it's a great way to start learning the core building blocks of music and rhythm in addition to learning a unique discipline. We would recommend Jason to anyone who is interested in wanting to play the drums!" "Jason has been an amazing drum teacher for our 8-year old son. He has the perfect combination of patience and instruction to help children learn. He brings his passion for music to his teaching, allowing our son both to explore music and focus on learning core skills. Jason clearly cares about his students’ musical development and I appreciate how he tailors his lessons to our son’s ability and interests. We are extremely happy with our experience with Jason and recommend him to anyone considering music lessons for themselves or their children."